Anyone who has had the patience to follow this adventure from the start knows that I am not solely to blame for my late-life fascination with the two-wheel wanderlust. It was, in fact, my wife, Delcia, who set us upon this road. It was she who bought the family’s first motorcycle. And though her commitment at the time was made in the name of fuel economy, it was a challenge to my machismo, nonetheless. In early October of 2009, as I key the first rough draft of this page into the web site, barely a year has passed since those inadvertent beginnings. By this time, nine different two-wheeled vehicles have followed paths into or through our garage. We’ve traveled thousands of miles on them, and we no longer refer to the economy or to macho pride when discussing why or how we ride. Now, our objective is simply– and without apology– the pursuit of all the vagabond pleasures a motorcycle can bring to the body, the mind, and the spirit… the sense of freedom we share, the achievements of pilotage and navigation, and the intimacy of watching over one another’s comfort and safety. As I put these words to the page, we are just hours from embarking on our first actual road trip together, our first ride to some undefined destination, intending to stay a night or two away from home without an agenda and with no objectives. Yes; I have had my own escapes– a novice tour in my initial Taking to the Road, a confidence-builder in my Smoky Mountain High, and the fellowship I found among New Friends and Red Necks. But Delcia and I have not yet traveled the road as a team… as a couple… as partners in discovery. We did share the wonder and excitement of distant roadways in A Riding Vacation at mid-year, touring Colonial Williamsburg and Maine’s unforgettable Acadian woods. But we trailered our mounts to those fantasy destinations. The bike rides were side trips as we traveled by car to visit family members scattered along the east coast. We towed our platform-bound bikes on that trip, not from a lack of venturesome spirit, but as a matter of expedience and practicality; it was the only way we could cover more than four thousand miles in the limited vacation time Delcia could take from the workplace. Now, we’re bound for Weiss Lake in Alabama, not much more than a hundred miles away. But there will be no car or trailer supporting this road trek. 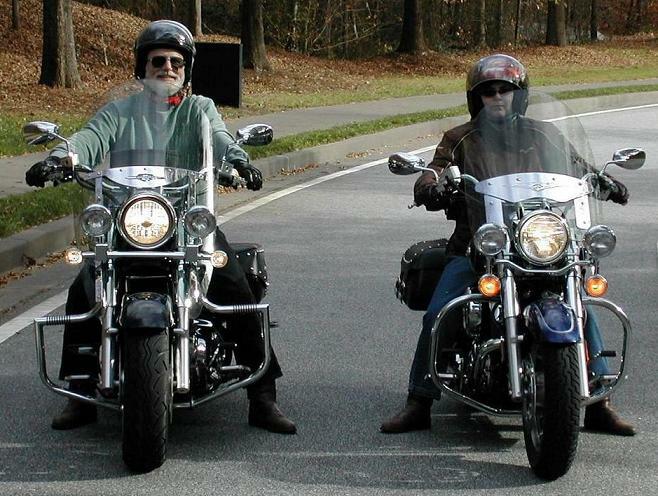 We will simply enjoy the countryside from the unrivaled perspective of our motorcycle seats. In the evening, we will stop for a relaxing lakeside dinner, and rest our backsides and our bikes in a comfortable motel before returning home by a different route. If it sounds pointless, or decadent, or even the least bit challenging… then clearly, you get the point.